You'll look like a regular Jack Sparrow! Avast ye mateys! In a little over a month, the forth installment of the Pirates of the Caribbean will hit movie theaters. This beloved franchise has been providing us with swashbuckling and high-sea adventures for almost a decade now and we can’t wait to see how this next chapter unfolds. Due to the magnitude of this event, it is very likely to have a midnight release at many theaters. Midnight releases usually also include diehard fans coming to the theater in costume. If you are the type of person who would like to don pirate garb, then look no further than Pearson’s Renaissance Shoppe. 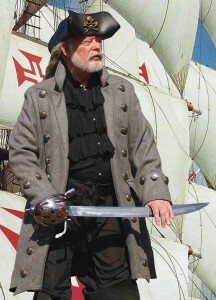 At Pearson’s, we have a number of different Renaissance pirate costumes to help you achieve any type of pirate look. But don’t forget that release date is May 20th, so don’t wait too long to order your pirate costumes. Maybe we’ll see you at the theater!